The Tipcheck device is used for examining the shaft of the tip probe or for determining the tip breakage etc. When imaging a new sample in an AFM, it may be difficult to know whether one has obtained an accurate representation of the surface. Even in the case that a fairly clear idea of expected feature topography exists, an independent means of assessing the influence of the probe tip on the image is desirable. A broken or misshapen probe tip results in inaccurate rendering of samples. Extra time from an already busy schedule can be consumed in further clarification work that wouldn't have been needed otherwise. Worse, if the tip damage goes undetected, the true topographical nature of your samples may inadvertently go unnoticed. 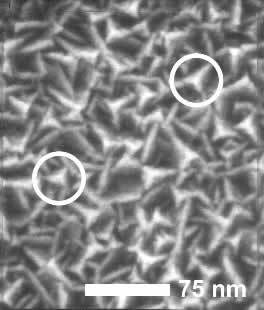 Using microscopy techniques such as SEM to look for breakage in tips is neither convenient nor economical enough to be done routinely. A simple, convenient means to prescreen all of one's AFM tips is certainly desirable! You and your team can thereby save time and effort, and avoid frustration. Fortunately, there is a simple and effective means to prescreen your tips, and assess used tips as well. TipCheck exploits reverse imaging to provide a fast and simple way to assess new and used tips without the need for SEM inspection. TipCheck helps you to categorize your tips on the spectrum at right, and permits qualitative comparisons between tips. The microstructure of the TipCheck film is ideal for the detection of tip morphology in the vicinity of the tip apex. The AFM images shown here were obtained by imaging a TipCheck surface with (left) a broken tip and (right) a reasonably good tip. The Nioprobe device is used to determine the shape at the very apex of the tip probe for microscopy measurements. The physical probe used in AFM imaging is not ideally sharp. As a consequence, an AFM image does not reflect the true sample topography impartially, but rather represents the interaction of the tip with the sample surface. There is no avoiding this imperfection, which sets real limits on what may be validly inferred from an AFM image. Whether one is engaged in detailed, quantitative metrology or is simply using AFM images as a interpretive aid, it is imperative be able to assess these limits. The key here is to possess a reliable estimate of the sharpness of the tip apex. Reverse imaging of the probe is the most convenient means of obtaining the effective radius of the probe. For this purpose, the ideal characterization sample would consist of small, stiff, spiked features. The surface structure of the NioProbe film is densely populated by tiny peaks. This makes the film very suitable for the small piezo movements characteristic of precision AFM work. 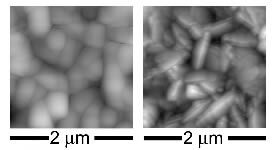 Feature peaks exhibit imaging radii of less than 5 nm, as sharp as anything else available. This permits one to obtain the accurate apex radius desired for medium- to small- scale work (such as biomolecular imaging). The random orientation of the NioProbe features are suitable for applying blind tip reconstruction methods. The sample is resistant to the duress of contact mode scanning. The film is supplied on a silicon chip, ready to be placed in your AFM. Instructions are provided to allow easy determination of the apex radius. If stored in a clean, dry place, the sample can provide years of service.